The Accelerated University English Program (AUEP) is a full-service, pre-academic ESL program. 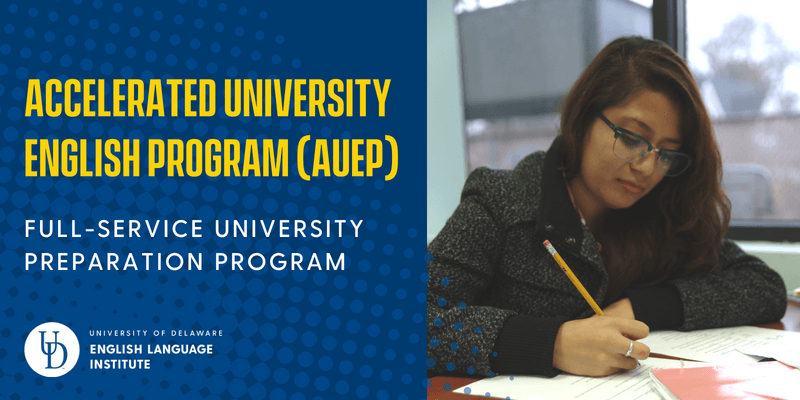 AUEP addresses the needs of students who plan to pursue undergraduate or graduate degree studies in the United States after completing their ESL studies. Through AUEP, students take similar courses and have similar preparation as what is seen in the Conditional Admissions Program (CAP); however, students in AUEP are not conditionally admitted to a CAP partner college or university. Instead, after AUEP students complete our program, they go on to study at many fine universities in the USA. Assistance in applying for admission to universities. AUEP is available to anyone who plans to attend a university in the United States and who has not been conditionally accepted to any of the ELI’s conditional admissions partner universities (i.e., AUEP students are not AT/CAP students). Any student who plans to pursue an undergraduate or graduate degree can participate in AUEP. No minimum English level or score is required. Although sponsored students typically enroll in AUEP (see below), the program is also available to students who are not sponsored (i.e., self-paying students). Sponsored students at the ELI typically enroll in AUEP. develop the academic and cultural skills needed for success at the university level. AUEP follows the main ELI calendar with two-month sessions. 2018-2019 Prices are valid for each sessions attended from August 27, 2018 to August 16, 2019. Important note about insurance: All students who are not sponsored by a governmental organization are now required to purchase the ELI’s health insurance plan. Students may not purchase their own insurance policy to replace the ELI’s plan. Health insurance fees are non-refundable. All students are required to pay a non-refundable application fee for all University of Delaware ELI programs. This fee pays for the express mailing of documents to students, such as I-20 forms, Welcome Packages, etc. Documents will automatically be sent via express mail (DHL or FedEx) unless the student specifically requests that the University of Delaware ELI use the US Postal Service or if a friend will pick up the documents on the student’s behalf. Students must pay this fee at the time that they submit their application to register for ELI programs. These fees must be paid if the ELI arranges transportation for the student from the Philadelphia International Airport to Newark, Delaware. Delaware Express (standard shuttle pick-up): Normally, the charge is $50; however, late-night pick-ups may cost $90. For questions, please contact eli-housing@udel.edu. Homestay: If the homestay family (or the homestay driver service) will pick up the student from Philadelphia International Airport, the fee is $75. If the homestay family (or homestay driver service) will drop off the student at the Philadelphia International Airport, the fee will be $60. Students must pay this fee only if they miss one of the designated Orientation days. All students are required to attend all days of ELI Orientation, as marked on their acceptance letter and in the documents that the student will receive when they arrive for Orientation. Students must pay this fee only if they do not meet the ELI’s deadlines for arranging housing (as listed in their acceptance documents). Students must pay this fee if they do not pay the entire amount listed on their bill before the date written on the bill. Are you ready to apply? Click the button below to see our admissions information and to complete the online application.